A little dizzy, a little fizzy. Sometimes you have to appreciate a wine for what it is instead of what it isn’t. Lauren at Hunter PR asked if I’d like the chance to preview a new line of wines – Barefoot Refresh. I said that I’d be happy to try them, albeit with a little bit of trepidation. Most of you out there are probably familiar with Barefoot – the value-priced, easily available line of California wines, both still and sparkling. Barefoot is clearly taking the “moscato boom” to heart. In addition to white, red, and “pink” versions of moscato as both sparkling and still wines; the Refresh “Sweet White” is moscato blended with pinot grigio and the “Summer Red” is a pinot noir rosé and moscato mix. The “Crisp White” is a Chenin Blanc/Riesling concoction. Over the years, I’ve tried a number of their wines and realized that I probably wasn’t their target demographic. “Pink moscato” is not usually my first choice. 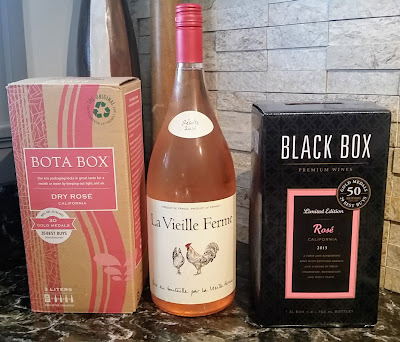 Still, a new series of wines deserves an open-minded view, so I popped them all in the fridge. All of their labels state “Best Served Chilled,” which usually makes me dubious. Chilling wine to fridge temperature usually kills the flavor. So, I braced myself, cracked the screwtops, and poured. Barefoot Refresh (NV) Crisp White –A simple, easy to drink, made-for-summer wine. I found a nose of grapefruit and melon, flavors echoed on the palate, along with some zippy citrus towards the finish. The slight effervescence makes the finish live up to its name. I imagine this would be a reasonable choice for a meat-and-cheese-plate picnic. Bubbles and acidity will cut through fatty and creamy flavors, especially on a warm day. Barefoot Refresh (NV) Sweet White – I hadn’t looked up the aforementioned blends before I tried the wines, and my note says, “Reminds me a lot of Moscato, but in a good way.” It’s not as tooth-numbingly sweet as many of the American, particularly Californian, versions, and the little bubbliness makes it more reminiscent of Moscato d’Asti. I found lots of peach on the nose, which also shows up on the palate along with some tangerine flavors. The finish is leaner than many other Moscato, which I think is a good thing. The bubbles prevent it from getting overly cloying. If you’re a Moscato d’Asti fan, this is a nice alternative. I’d imagine the varied flavors of brunch would be a good match. 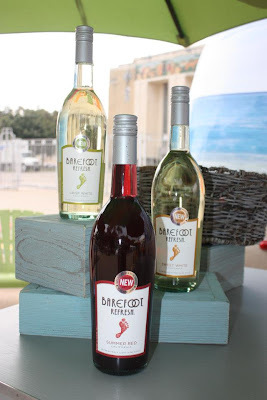 Barefoot Refresh (NV) Summer Red – I had an odd progression of opinion with this wine. At first taste, I simply didn’t like it. It reminded me a lot of those non-alcoholic sparkling grape juices you’ll see in the supermarket that sometimes get opened as “alternative beverages.” The flavor was similar to a cranberry-and-strawberry spritzer. That said, something about this wine rang my memory bell. It hit me later that evening – it tasted a lot like Lambrusco – the inexpensive, sweet Italian jug wine which I never cared for much – unless it’s with shellfish. I was planning to make some herb-roasted peel-and-eat shrimp for dinner, so I tried it alongside. You know what? Sometimes “Not bad” is good enough. Afternoon shrimp cocktail or some such with this wine would be workable. Are these the best wines in the world? Nah. But for a brunch with or a summertime pull-and-pour, you might them worth a try when they become available in your area. 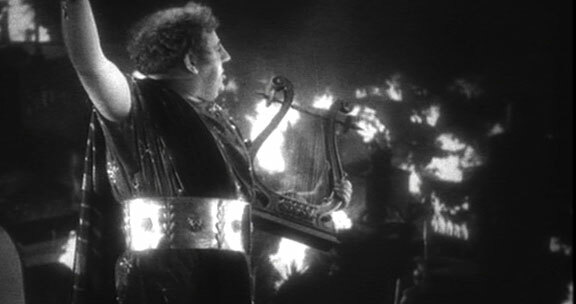 Quick quiz…I say “Nero.” What pops into your head? "Ambassador Spock will be joining us at our next wine tasting." Nero d’Avola is an Italian, predominantly Sicilian, wine grape varietal. As you probably remember, most Italian wines draw their name from the location they’re grown rather than the actual varietal of grape. Nero d’Avola eliminates the confusion by including both. In Italian, “Nero d’Avola” translates as “The Black [Grape] of Avola” – Avola being a town at the southernmost tip of the island of Sicily near the city of Syracuse. The varietal is less commonly referred to as “Calabrese” – meaning “from Calabria,” the Italian province straight across the Strait of Messina from Sicily. Nero d’Avola grows best in hot, Mediterranean climates. Sicily certainly falls squarely into that definition. Grapes that thrive in warm weather regions tend to yield wines with stronger fruit flavors and higher alcohol content, and Nero is no exception. Its dark, tannic juice has long been sought as a blending grape to add depth and color to lighter wines on the mainland. Advances in winemaking technology have improved the single-varietal quality of these grapes markedly. Sicily is currently third in overall production among Italian wine regions – with the skyrocketing production of Nero d’Avola bolstering the already ample yield of the ubiquitous Marsala grape. What’s Nero d’Avola taste like? The best parallel I’ve seen out there is Australian Shiraz, although I find The Black to be more tannic in general. As with most high-tannin wines, it usually takes a couple of years for the tannins to calm down and mesh with the other flavors, so if you’re looking on the shelves of your local quality wine retailer, don’t be afraid to pick up a bottle with a couple of years under its cork. Nero d’Avola also has aging potential, so if you find one you enjoy, don’t be afraid to stash a few bottles in the ol’ cellar for a little while. Nero d’Avola is also sometimes made into rosé for summertime consumption. Poggio Anima 2010 “Asmodeus” Nero d’Avola – Asmodeus, as any owner of the original Dungeons and Dragons “Monster Manual” can tell you, is the Lord of Hell. I doubt the terroir for this wine is quite that intense, largely because brimstone is not part of this wine’s big, bright flavor. My first impression was of blackberry and cherry on the nose and palate. It’s medium-to-full body, but it’s not as “sticky” as a similarly bouqueted Shiraz would be. Instead, the finish leans out, turning first to a nice tannic dryness and then into that mineral character that many Italian wines possess. I thought it was a wonderful food wine. We had this next to a penne pasta with wilted arugula, diced tomatoes, and goat cheese, topped with roasted pork (recipe here). There are worse wines to accompany any number of sins, gluttony being the top of the list. $13. Regaleali 2008 Nero d’Avola – Under other, more blindfolded circumstances, I might have mistaken this for a Bordeaux. (And certainly more like a Bordeaux than a Rhone, which I’d have expected with a “Shiraz-like” grape.) My first thought on spinning this was, “Wow. Funky!” There’s a real whiff of earthiness on the nose, coupled with a nice bit of cherry. I’d call it medium bodied, in line with the aforementioned French doppelganger. Good dark fruit on the tongue with some gradually-building tannins. There’s plenty of length on the tannic, chalky finish. We had this with leftovers from the same meal we made for the Asmodeus. The flavors of the pasta had blended into a nice yumminess, and the extra earthy characteristic in this wine made it an even better complement. Another great, though very different, food wine. $15.